Wash rice till it becomes transparent. Pour with water and boil for 15 min covered with lid. In 15 min turn off the heat and let it stay covered for 10 min. Dissolve in sushi-vinegar sugar and salt. Pour rice with this, mix (better with a wooden spoon), spread over the surface and let it stay for another 15 min. Cut eel into strips of 1*1 сm. 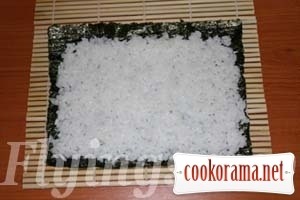 Spread nori sheet on mat and spread rice on top (for this soak hands in water with lemon). 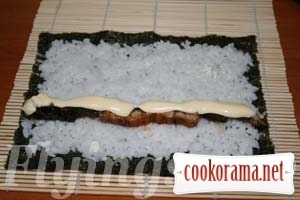 Then spread eel and mayonnaise. Wrap the roll with mat, holding stuffing. 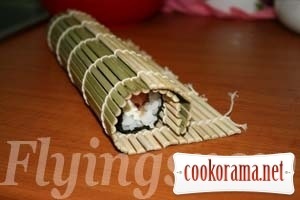 Wrap it, gradually compacting roll by pressure. 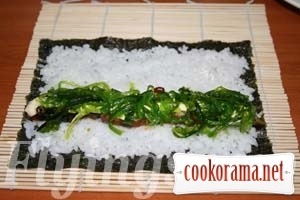 Cut roll in pieces, wetting the knife in water. 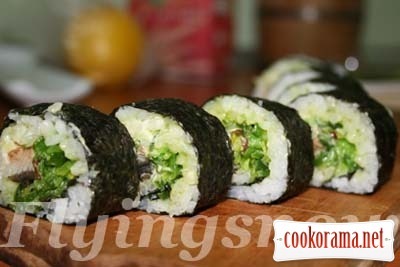 Use traditional soy sauce, wasabi and ginger. 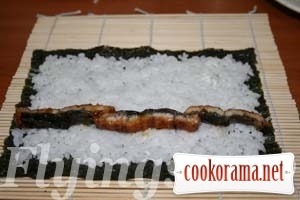 Top of recipe "Sushi Time: Unagi Roll"